In Windhoek, Namibia, a plant opened in 2002 has developed advanced technologies to reuse municipal wastewater for drinking water. 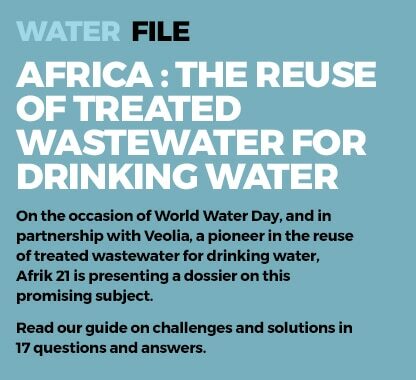 A detailed review of technologies to provide 25% of drinking water to about 400,000 inhabitants who drink recycled wastewater from the tap. Under chronic water stress, Windhoek, the capital of Namibia, has chosen since 1968 to use treated wastewater reuse to produce drinking water. A unique reference because the direct reuse of wastewater is very rare in the world where only 4% of wastewater is recycled, generally for industrial needs. Since 2002, a new plant operated by Wingoc (Windhoek Goreangab Operating Company), the consortium formed by Veolia and VA Tech Wabag, has supplied more than a third of the drinking water to the city of Windhoek. To eliminate any health risks, the plant uses advanced “multi-barrier” technologies. They ensure that drinking water quality meets the highest standards and that consumers’ health will not be affected. Detailed review of the different processing steps. Water from two sources can potentially be used for the production/reclamation of drinking water: These are secondary treated wastewater and Goreangab Dam. Either one or a combination of both can be used. Whereas since start-up the surface water from the dam was only added to supplement the raw water at low percentages, and as from 2008 the sole source of raw water is secondary effluent. Powder Activated Carbon can be added to the raw water to remove algae and dissolved organic carbon, should it be required. Ozone (O3) is added to the raw water, this will partially oxidise dissolved organic matter like humic substances to enable the removal thereof by enhanced coagulation and partially deactivation of harmful microbiology. Ferric Chloride (FeCl3) is added, which causes the destabilisation of visible and colloidal particles and dissolved matter resulting in the formation of flocs. 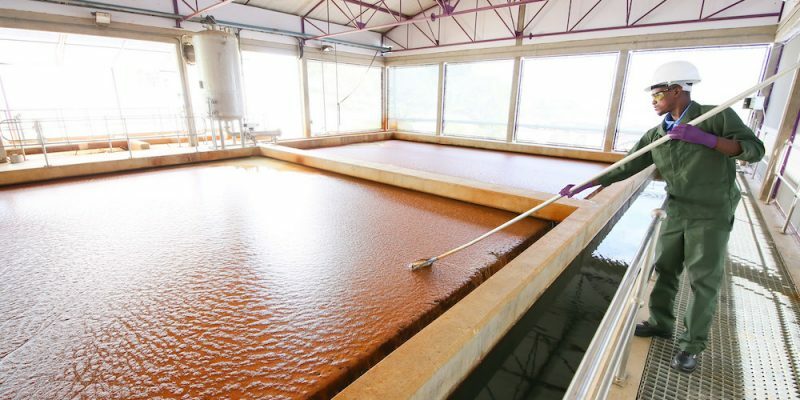 During this step the water is stirred only slowly and the small flocs, which were formed during the coagulation will grow into bigger particles. This process can be supported by the addition of organic polymers. After the floc formation the water containing the flocs is brought into contact with microscopic air bubbles, originating from air saturated water, resulting in the air bubbles sticking to flocs and forming a scum layer, which is accumulated at the water surface. The scum layer as well as flocs, which did not float but settle, are removed periodically. Before the water flows to the dual media filters caustic soda (NaOH) and potassium permanganate (KMnO4) is added to stabiles the water and to oxidise and precipitate dissolved iron (Fe2+) and manganese (Mn2+). The next step is dual media rapid gravity filtration. The first layer of the filter bed is coarse-grained Anthracite and the second layer is fine sand. Suspended particles, which were not removed during the dissolve air floatation process but also bacteria and other microorganisms are partially removed. The filters are periodically cleaned by backwashing. The resulting heavily polluted backwash water is, together with the waste of the dissolved air floatation process, discarded to the nearby wastewater treatment plant. Ozone is a very powerful oxidant. This gas is produced on site from high purity oxygen, which again is produced on site. The ozone gas is injected into the filtered water to oxidise dissolved organic compounds to biodegradable dissolved organic compounds and for the inactivation of bacteria, viruses and parasites still in the water. This (partial) oxidation of dissolved organic compounds does also apply for non-biodegradable pharmaceuticals, which are present in the water, these compounds get deactivated and can then undergo biological degradation. After ozonation the residual ozone is destroyed by the addition of small amounts of hydrogen peroxide. The oxidised organic compounds are now removed by the microorganisms of the biological filter. Granular activated carbon provides an ideal surface for the attachment of microorganisms. The BAC filters are periodically backwashed and this backwash water is recycled into the raw water tank. The remaining dissolved organic compounds in the water are adsorbed onto the granular activated carbon to produce water with very low concentrations of dissolved organic matter. The production of potable water with very low concentrations of dissolved organic compounds is important to prevent the formation of disinfection by-products, which could be detrimental to human health. As the BAC filters, the GAC filters are backwashed periodically and the water is recycled into the raw water tank. Ultrafiltration membranes are used as the final polishing step for the removal of remaining suspended particles, including bacteria and viruses. The membranes are backwashed periodically and chemically cleaned. The backwash water is also recycled into the raw water tank. The final water is prepared for blending with other potable water sources by adding chlorine (Cl2) for disinfection in order to prevent any health risk for the consumer and caustic soda for pH correction and stabilisation. The final potable water conforms to high quality standards and guidelines. This water is pumped to the New Western Pump Station, where it is mixed with other surface water sources. Only the mixed water is distributed to the consumers in Windhoek. The overall process with the reclamation plant takes less than 10 hours.